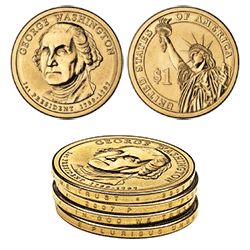 The Presidential $1 Coin Program began on January 1, 2007, and will continue until every eligible President is honored. Each coin will feature each of four presidents per year on the obverse, and each Presidential Dollar will be issued for three months before moving on to the next president in chronological order by term in office. On the reverse of each coin there is an image of the Statue of Liberty, and inscriptions reading "$1" and "United States of America". The $1 inscription is of interest in that it is the first time that a number rather than the written value has been used to state the face value of a United States coin. The Presidential Dollar is also the first United States coin since the St. Gaudens Double Eagle to bear an inscription along the edge, which has the year of issuance, the mint mark, and also the legends E Pluribus Unum and In God We Trust. In December of 2007, Congress passed HR 2764 moving "In God We Trust" to either the obverse or reverse of the coins. The Treasury determined the Statue of Liberty to be sufficient for conveying the message of liberty and as such, the inscription "Liberty" does not appear on the Presidential Dollars. The size and composition specifications of the Presidential Dollar are identical to those used for the current Golden Sacagawea dollar. The Presidential $1 Coin Act specifies that for a president to be honored, the former president must have been dead for at least two years before issue. If a president does not meet this requirement at the time that the coin would be issued, then that president will be skipped and the next president that meets this requirement will be honored. The Presidentail $1 Coin Program will terminate when all the presidents eligible at that time have been honored, approximately eleven years from the first issuance. Presidential Dollars are being issued by Philadelphia, Denver and San Francisco Mints.